Now with an all new lightweight aluminum cylinder! Make it a part of your first aid program. The LIFE® OxygenPac Model LIFE-612 provides supplemental oxygen in two ways. First, as an inhalator for a breathing victim and, second, as a CPR resuscitator adjunct for a non-breathing victim. It's delivered to you pre-filled with oxygen so it's ready-to-use when you need it. It comes complete with a LIFE mask for "mouth-to-mask" resuscitation with a one-way valve for use on children and adults. This eliminates direct contact with the victim's mouth and nose while resuscitating a non-breathing person. The LIFE®OxygenPac Model LIFE-025 has all the same features and provides a variable selection of 12 liter-flow rates for EMTs and others that are knowledgeable and practiced in administering supplemental first-aid Emergency Oxygen in a wide variety of emergency situations for patient survival. It provides variable-flow with 12 click-stop flow-rate settings of 0,.25,.5,1,2,3,4,6,8,10,15,25 LPM. The LIFE OxygenPac should be part of your first aid program. It's simple and easy to use with external two-step instructions and clear cover. It's wall mounted for recognition and accessibility--it's always available on display. The FDA minimum 6 LPM "Norm" will yield up to 90 minutes of oxygen, and 12 LPM "High" delivers the AHA recommended 100% inspired O2. And best of all, you can easily replace the disposable cylinder with LIFE-101 Spare Cylinder, or it's refillable at low cost by any compressed gas distributor with universal CGA #870 fitting. 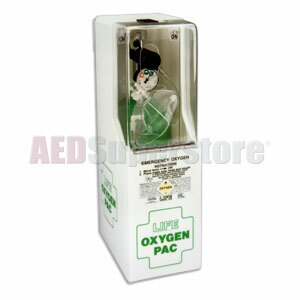 Note: Because all LIFE® OxygenPacs are shipped completely filled and ready-to-use, they must be shipped via UPS Ground. Very happy with our purchase. Shipping was fast and the product is excellent. Tis unit comes completely ready for emergency use. It is filled, setup with tube and mask all ready to go. The regulator is designed to be very easy to use and understand. the case it comes in is great to protect it and for ease of use in an emergency.